Special dates: Friday, September 22 is opening night, followed by a reception with the cast. Sunday, September 24 is Senior Sunday; seniors age 65+ pay $20. Talkbacks follow the September 24 and October 1 matinees. Due to the intimate and interactive nature of the show, only 50 seats will be sold for each performance. You're six years old. Mom's in the hospital. Dad says she's "done something stupid." She finds it hard to be happy. So you start to make a list of everything that's brilliant about the world. Everything that's worth living for. 1. Ice cream. 2. Kung Fu movies. 3. Burning things. 4. Laughing so hard you shoot milk out your nose. 5. Construction cranes. 6. Me. You leave it on her pillow. You know she's read it because she's corrected your spelling. Soon, the list will take on a life of its own. The production is directed by Laura Ekstrand (Livingston) and features Dreamcatcher ensemble member Clark Carmichael (Montclair). 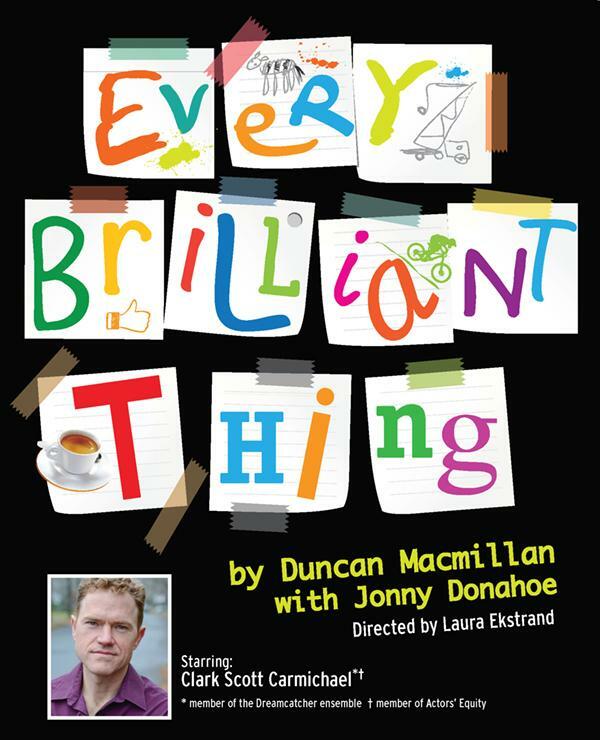 Playwright Duncan Macmillan’s other plays have been produced at the Royal Court Theatre and the National Theatre in London as well as the Studio Theatre in Washington, DC, among many others. Co-author Jonny Donahoe is an actor, comedian and writer, and was nominated for a Lucille Lortel and Drama Desk Award for his performance in Every Brilliant Thing. This solo show that is performed in the round had its debut in London and then travelled to Off-Broadway in 2016. In it, the protagonist engages the audience by asking them to read items from the list and, occasionally, to help him tell his story. Sincere but not sentimental, Every Brilliant Thing deals with mental illness and its impact on a family. It employs humor and theatricality to reveal the way tragedy can yield both sweetness and sorrow. The facility is wheelchair accessible. Assistive listening devices for the hearing impaired and advance large print scripts are available for free by prior arrangement. To purchase tickets or for information on any of Dreamcatcher Repertory Theatre's programs, visit www.dreamcatcherrep.org or contact Dreamcatcher Repertory Theatre at Oakes Center, 120 Morris Avenue, Summit, NJ 07901, business phone 908-514-9654.